I came back to this one for another look as it has long been a favorite, only to discover I had not previously left a comment or voted... situation now rectified! Amazing image ..love the treatment! I love the way you process your pictures!!!! great color and texture on this one. FAB. love love love it. Excellent composition. Love the colors !!! Thanks for the mention Craig. Great image. Very cool processing takes this from a good minimalist image to a more interpretive photo. This has a surreal feeling to it...almost feeling as though it belongs in the "fell to earth" project. Wonderful shot! Your treatment is just fantastic here! V.
Wow, this is such a fantastic image. The composition and colour are stunning. There's a strange, flattened perspective that turns it into an extraordinary shot. V.
Very effective composition. I like the colour treatment and lighting. One of your best Craig. An amazing image. What gets me when I see your work is the creativity that must go through your mind with each image. Really nice. Super composition, color and light. GMV. Bingo...you hit the jackpot !! Fantastic treatment. Like a painting. Yes, Tati. Maybe "Mon Oncle" futuristic wolrd of the 70s. WoW, Craig. I can only repeat what everyone has already said. Absolutely voted. Great treatment - more painting than photo. Great surreal feeling! PP is exceptional! Excellent shot and treatment. Perfect composition. En effet, ça semble sur une toile. J'aime bien les teintes et l'endroit où sont les lumières sur la photo, l'arbre dans le coin et les deux nuages de chaque côté... beau câdrage, belle compo. I simply live the square format. 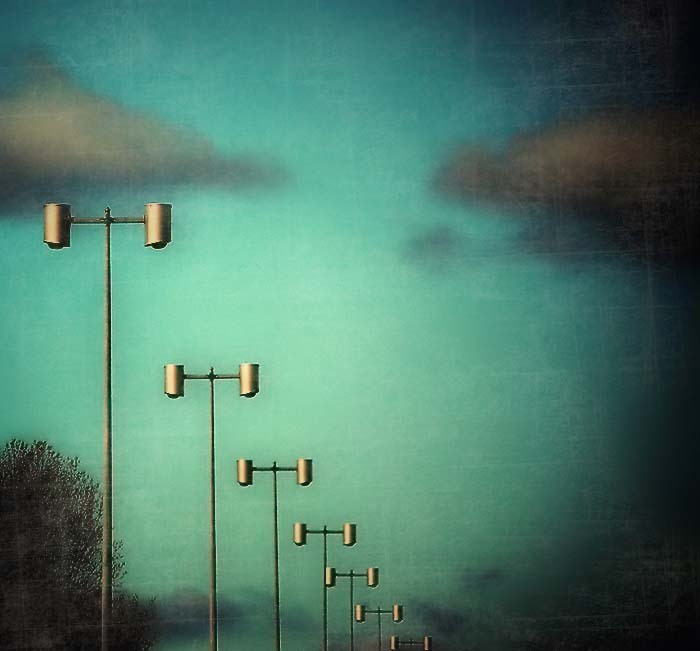 The texture of the background looks so much like oil on silk, the lamp posts give the modern touch. Creative work indeed. Top-notch treatment, color and compo. Another simplicity at its best. VOTED! Man, you eke out the mightiest greenblue hues. Vote. Like a painting, again - Magritte would have loved it for sure, superb! Very good colour and exposure effect. Cool shot, looks like a painting!